Have You Seen the Bank On Yourself Reviews YouTube Playlist? « Will Your Money Last as Long as You Do? In their own personal YouTube reviews of Bank On Yourself, actual users of the Bank On Yourself strategy describe the different ways they use this flexible tried-and-true financial resource. We’ve collected some of these reviews in our YouTube Bank On Yourself Reviews Playlist. Perhaps you want to be able to seize an unexpected opportunity that requires ready cash, or pay off student and credit card debt, take a once-in-a-lifetime vacation, finance the purchase of an automobile, or even underwrite the crowdsourcing of a church major fundraising campaign. These Bank On Yourself reviewers tell you how they did it. And just as they did, you’ll find that borrowing against the cash value of your permanent life insurance policy is a quick, affordable, and simple way to get the cash you need in just a few short days, with no questions asked. Opportunities come in various forms, don’t they? Out of the blue, Greg Gammon got a call from his stepbrother, letting him know they wouldn’t be able to keep the baby girl they were expecting in four days, because of a difficult personal situation. They didn’t want a stranger to adopt her. Would Greg and his wife Christy consider becoming her new parents? Greg and Christy didn’t have to think twice before saying yes. But they realized there would be fees involved in the adoption. Greg’s alternatives weren’t very good: He might be able to put the fees on a credit card, but he’d need to get an increase on his credit limit. Taking out a home equity line of credit would be tough because the real estate market was in the toilet. So Greg and Christy called their Bank On Yourself Advisor, who handled the simple paperwork. The funds were in the Gammons’ checking account within days, and they flew home with their beautiful new baby girl. Watch Greg’s Bank On Yourself review on our YouTube playlist. Unlike many students, Rose Hillbrand managed to get through college without relying heavily on student loans. But once she entered graduate school in Ohio, all of that changed. Not only was she forced to take out student loans, but her part-time job didn’t pay enough to handle her monthly living expenses. Rose covered the shortfall by running up debt on her credit cards. Rose started paying off some of her loans and credit cards when she landed her first job out of grad school. But, figuring she had plenty of time to deal with her debts, she didn’t get serious about paying off all of it. When she relocated and started working full-time as a ballroom dance instructor, Rose once again wasn’t making enough to cover basic expenses. Plus, she had an aging car that needed expensive repairs. Desperate to find a solution, when Rose heard about Bank On Yourself, she quickly made an appointment with an Authorized Advisor. Rose’s Advisor assessed her situation and helped her think through changes she needed to make to get on top of her financial situation. Rose decided it made the most sense to start small with her first Bank On Yourself policy and that she could afford a premium of $2,500 per year. With her Authorized Advisor’s assistance, Rose decided to use funds she had in a small IRA to pay the premium for a couple of years until her cash flow improved. Rose then started viewing ballroom dance instruction as more of a hobby and switched to part-time. She took her love of dance to develop an online business to increase her income. Additionally, because Rose was so impressed with the guidance her Bank On Yourself Advisor gave her, she went to work for him as well! Rose began to reduce her debt then decided to eliminate it completely. About two years after starting her first Bank On Yourself policy, she took out her first policy loan. A couple of months later, Rose paid off the couple thousand dollars she still owed on her student loans. One by one, she knocked off all the other debts on her list. 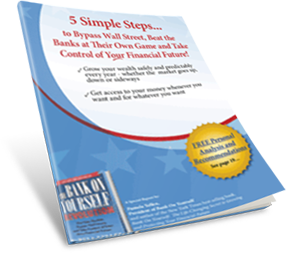 Besides the peace of mind this gave her, eliminating debt freed up her cash flow, which Rose used to take out another Bank On Yourself policy—about twice the size of her first one. Rose now knows there is something even better than being debt-free. Watch Rose’s Bank On Yourself review in her own words on our YouTube playlist. Dave and Hillary Corey have enjoyed the benefits of Bank On Yourself policy loans to buy two sets of beautiful custom-made Amish furniture for their home. They’ve used their cash value to pay their real estate taxes rather than using an escrow account. And thanks to another Bank On Yourself policy loan, they finally paid off their student loans. You’ll enjoy Dave’s sense of humor, and you’ll learn from his Bank On Yourself review how he and his family are using their Bank On Yourself policy to fire their banker and be their own source of financing when you watch his YouTube review of Bank On Yourself. Jon Bowsher and his wife, Lee, started Bank On Yourself as a supplement to their 401(k) retirement plan. But because of stock market downturns, his Bank On Yourself strategy has become his primary source of retirement funding. Jon and Lee started cautiously, with one policy for each of them. Three years later, once they realized the Bank On Yourself strategy was rock-solid, they added a policy for each of their three kids. Jon and Lee’s most creative use of the loan feature of their policies came when their church pastor told the congregation the New Testament parable of the “talents” – how a wealthy man gave each of his three servants a certain number of talents of gold to invest on his behalf. In discussions with their minister, Jon and Lee caught the vision of giving every adult member of their church $50 and every child $10 to invest in some form of enterprise, then return the seed money and the earnings to church. The church is large – 2,000 members – and in order to make the plan work, someone would have to come up with $100,000. Jon and Lee were one of three families who pooled their resources to fund this venture. The project was a success for the church. They actually doubled their money – the three families got their money back, and the church members used the seed money to generate an additional $100,000, which the congregation used to finance four different mission projects. Jon says he and Lee could only fund this project because of their Bank On Yourself policies. Watch this heartwarming story as told by Jon himself on our Bank On Yourself Reviews YouTube playlist. Perhaps these true experiences from real Bank On Yourself reviews have given you some inspiration. To find out how a Bank On Yourself policy can be structured for maximum growth and flexibility for your family, request your FREE Analysis. You’ll receive a referral to an Authorized Advisor (a life insurance agent with advanced training on this concept) who will prepare your Analysis and give you personalized recommendations about what Bank On Yourself can do for you.